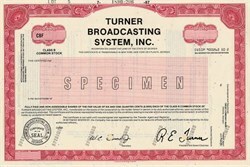 Beautifully engraved RARE Specimen certificate from the Turner Broadcasting System, Inc. printed in 1996. This historic document was printed by the American Banknote Company and has an ornate border around it. This item has the printed signatures of the Company's President and Board Chairman, R. E. Turner ( Ted Turner ). This is the first time we have had this Specimen certificate for sale. Robert Edward "Ted" Turner III (born November 19, 1938) is an American media mogul and philanthropist. He is best known for co-founding CNN, Turner Classic Movies, and Cartoon Network, his failed marriage to Jane Fonda, and his $1 billion pledge to the United Nations (see United Nations Foundation). Turner's penchant for making controversial statements (often classified in the foot-in-mouth category) has earned him the nickname, "The Mouth of the South." Turner's media empire began with his father's billboard business which he took over at the age of 24 after his father's suicide. Purchase of an Atlanta UHF station in 1970 began the assemblage of the Turner Broadcasting System. His Cable News Network revolutionized news media, coming to the fore covering the space shuttle Challenger disaster in 1986 and the Persian Gulf War in 1991. Turner was born in Cincinnati, Ohio. When he was nine years old, his family moved to Savannah, Georgia. He attended the McCallie School, a unaffiliated Christian prep school in Chattanooga, Tennessee. Colorful episodes from his life include being expelled from Brown University for having a female in his room in 1960, and winning the America's Cup in 1977. At university, Turner was an unspectacular student in class, though he did compete on the debating team and accept membership into Brown's secret society, Pacifica House. He purchased the Atlanta Braves and Atlanta Hawks in 1976 and created the Goodwill Games in 1986. His relationship with the Braves was somewhat peculiar before the team's success in the 1990s; Turner was one of the more hands-on owners in baseball history, at one point going as far as to give the team's regular manager the day off so Turner could manage. About this experience, he famously said, "Managing isn't that difficult, you just have to score more runs than the other guy." After a failed attempt to acquire CBS, Ted Turner purchased the legendary but struggling Hollywood Film Studio Metro-Goldwyn-Mayer (MGM) from Kirk Kerkorian in 1986 for $1.5 Billion. Following the acquisition, Ted Turner assumes an enormous debt and had no other choice but to sell parts of the acquisition. United Artists and the MGM "Leo the Lion" Trademark logo was sold back to Kirk Kerkorian. The MGM Studio lot in Culver City was sold to Lorimar/Telepictures. Turner kept MGM's pre-1986 and pre-merger film and tv library, which included nearly all of MGM's material made before the merger, and a small portion of United Artists film and TV properties (which included very few UA pictures, the TV series Gilligan's Island, the RKO Radio Pictures library, and the pre-1948 Warner Bros. library that was once the property of Associated Artists Productions, UA Television's predecessor company). In 1988, Turner purchased World Championship Wrestling (in 2001, under AOL Time Warner control, it was sold to the competing World Wrestling Federation). In 1989, Ted Turner created the Turner Tomorrow Fellowship to be awarded to a work of fiction offering positive solutions to global problems. The winner, chosen from 2500 entries worldwide, was Daniel Quinn's Ishmael. He founded the Turner Foundation in 1990. On September 22, 1995, Turner Broadcasting System, Inc. announced plans to merge with Time Warner Inc. This merger completed on October 10, 1996, with Turner as vice chairman, head of Time Warner's cable networks division. On January 10, 2000, Time Warner announced plans to merge with AOL as AOL Time Warner. This merger closed January 11, 2001. He is America's largest private landowner, owning approximately two million acres (8,000 km�). He also has the largest private bison herd in the world, with 40,000 head. In 2002, Turner co-founded Ted's Montana Grill, a restaurant chain specializing in burgers made from fresh ground bison meat. Ted Turner has acknowledged that he has a bipolar affective disorder. In high school National Forensic League competitions, Public Forum Debate, a style of debate created in 2002 and formerly known as Ted Turner debate, is practiced. It was named after Turner for its distinctive "Crossfire" style of cross-examination, modeled after the Crossfire show on CNN.